I’m sure I’m not alone, but I’ve never really understood the Facebook poke. The attempt to get someone’s attention by virtually jabbing your finger in their side or arm, or wherever else you might picture the poke landing, just doesn’t make sense. Despite that, through all of the changes that Facebook users have seen, complained about and resisted, the one thing that that has stayed constant is the poke. Now, thanks to Jasper van Loenen and Bartholomäus Traubeck, the Facebook poke has been translated into a real-life poke, so if they want to, your friends can annoy you endlessly all day long. So how does it work? 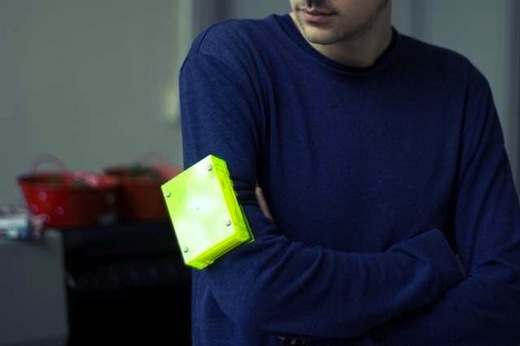 Strap it to your arm – or wherever else you choose to, we won’t judge – and every time a friend pokes you, the little contraption will jab away. Online social networks are platforms for communication, enabling us to connect anywhere we go. However, they still lack the mediation of physical communication. Facebook tries to improve this by enabling its users to ‘poke’ each other, which basically only sends another written message to the person you poke, without conveying the original intent of the poking gesture. The Poking machine converts the message into an actual physical poke, extending the reach of this haptic gesture indefinitely. This way users can connect not only virtually but also physically.